TBILISI, DFWatch–Georgia’s president has appointed a new head of the National Bank (NBG). The appointment was signed by President Giorgi Margvelashvili on Thursday. Outgoing NBG head Giorgi Kadagidze will be replaced Koba Gvenetadze, a former politician and economist with a background from the International Monetary Fund (IMF) in Washington. Margvelashvili praised the new NBG president. “Such a high professional will benefit the National Bank and positive processes which we are hoping for in our country’s economy,” he said after meeting Gvenetadze. The president said Gvenetadze was supported by members of parliament, and the council of NBG nominated him as a candidate for president on March 16. The parliament approved him on March 2. Since November 2015, Gvenetadze has been adviser in economic affairs at Galt and Taggart, a subsidiary of Bank of Georgia, a private bank. From 2002 to 2015, he was chief economist at the IMF’s Middle East and Central Asian Department in Washington. From 2001 to 2002, he was deputy state minister and from 2000 to 2001 deputy finance minister. 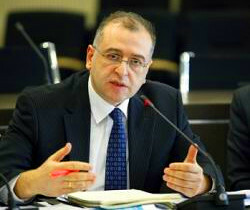 Gvenetadze was a representative economist of the IMF in Georgia from 1996 to 1998, and from 1994 to 1996 he was a senior economist at the National Bank.